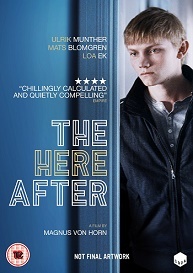 The Here After is out on DVD on the 4th July, and to celebrate we have a great competition for you and 2 copies on DVD to give away! Swedish drama written and directed by Magnus von Horn. Teen pop star Ulrik Munther plays John, recently released from prison for an unknown crime. He returns to his rural family home to stay with his dad (Mats Blomgren) and younger brother (Alexander Nordgren) in the hope of reassimilating into his former life. The local community and student body at his old high school struggle with his presence, and soon John is being attacked by strangers in shops and other pupils. His failure to respond to these acts intrigues new girl Malin (Loa Ek), whose curiosity draws out the details of the incident that led to his imprisonment. The attitude of the local community descends rapidly, committing hostile acts of violence and aggression against John and his family and it seems he must take action to protect his father and brother.